Merchants- AvantExpo Early Bird Pricing Ends Soon! AvantExpo early bird pricing is ending on March 1 for merchants and agencies. That means you have just five more full days to take advantage of prices discounted by 20% to attend the affiliate industry’s most anticipated networking event of 2017. Don’t miss out on the three levels of all-inclusive sponsor attendance packages while the early bird pricing is still here. Each package includes networking suites at the event venue, registration costs, meals, drinks, activities and more! 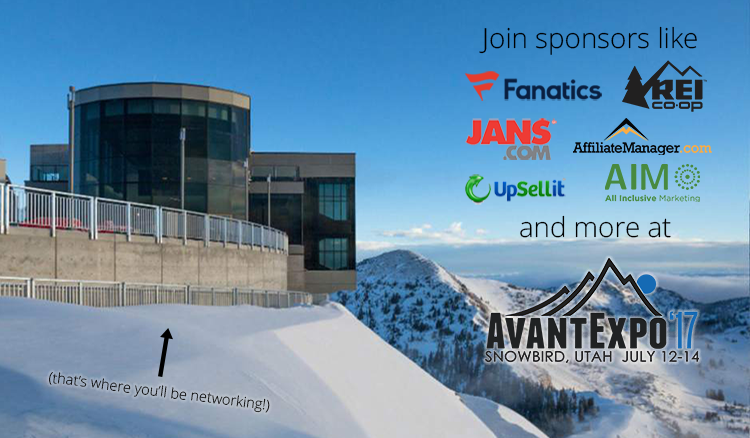 If you agree that the best business relationships can only be built in state-of-the-art buildings probably owned by the latest James Bond villain at the top of a mountain, AvantExpo is for you. If you feel like face-to-face time with the most influential and high-impact affiliates, merchants and agencies in the affiliate industry is valuable to helping your ROI and growth, AvantExpo is for you. If you agree that attending a conference designed to get new business plans and strategies finalized in person at the event instead of defaulting back to long email and phone conversations, then AvantExpo is for you. If you would rather network and create new relationships in a very memorable, unique environment that defies the typical big-city setting (but is still only 25 minutes from the airport), then AvantExpo is for you. From the affiliate side, a carefully selected list of the most high-impact and prolific affiliates from the AvantLink network. This is also paired with selections of affiliates who may not be top tier performers yet, but have demonstrated their dedication to growth and mastery in the affiliate channel. It’s an eclectic mix. Side note: If you are an affiliate who would like to attend, please visit AvantExpo.com and submit an attendance request for consideration. On the other side of things are the merchants and agencies that opt to attend the event. Attendance for this group of participates is done through sponsorship attendance packages. Those who attend range from the most successful online retailers and agencies in the AvantLink network, to new program launches looking to supercharge the affiliate channel by getting in front of the best affiliates in the industry. Many attendees will say that attending AvantExpo takes a certain amount of “outside the box thinking”. The conference is largely built around ample networking time for strategic business planning. Compared to other industry conferences, AvantLink’s user conference is relatively light on the typical offerings you usually see like education sessions or keynotes. AvantExpo attendees come with a primary goal to network, solidify new business, and earn the ROI they expect to see from attending an event like this.